There is a long tradition of including maps in children’s books. They introduce young readers to new fictional and real worlds and draw them further into the stories they illustrate. They provide children with an exciting view of our world – and they do this in a small space and with just a few words, though often with a lot of colour and a great love of detail. Maps in children’s books serve for orientation and have long been a fixed component of children’s literature. Be they fictional or real places – they are always about giving the reader an overview. Today you will no longer find fold-out maps printed on very thin Bible paper, like in early editions of the children’s classic Robinson Crusoe by Daniel Defoe. However, the stylistic diversity of the maps is huge and the quality of the print also has a positive impact on the depiction. 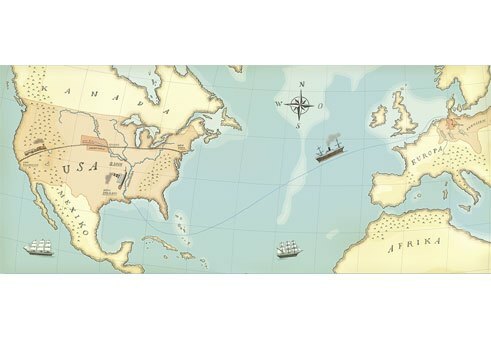 Why are maps a popular tool in children’s books? Historical topics can be conveyed more graphically with their help, for example. The illustrated non-fiction book In die neue Welt (Into the New World) by Christa Holtei, illustrated by Gerda Raidt, is about a German family who emigrated to America in the middle of the 19th century. “The maps illustrate what is narrated on another level and make it more tangible. The basis for my drawings were maps from books and from the internet. I discovered the map with the many German-named places in the US in a book about emigrants. It impressed me very much in view of the fact that it all really happened,” explains Gerda Raidt. So the young readres can follow the ship’s route from Hamburg to New Orleans with their finger. 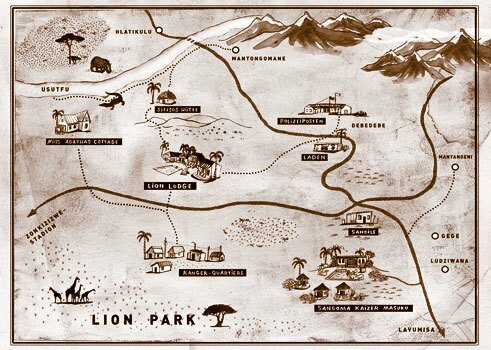 A remarkable feature of Raidt’s map are the precise pencil drawings, which she then colours at the computer and provides with hand-written place names. Anke Bär also invites us back to the past: Her non-fiction book for children of primary school age, Endres, der Kaufmannssohn (Endres, son of a merchant) provides insight into life in medieval Lübeck. Everyday life in that city is shown from the viewpoint of the 12-year-old Endres. So as to depict at a glance the German Hanse, that important association of merchants, with the most important Hanse cities, foreign counting houses and trade routes, Anke Bär chose a map showing Germany and its northern neighbours. In doing so, she also takes up stylistic elements from medieval book illustration. Martina Badstuber takes her young readers on a trip around the world. In Ich kenn ein Land, das du nicht kennst (I know a country you don’t know), she brings together astonishing, odd or amusing traditions or customs from different countries. A major component of the book’s pages are maps. A map of the world placed at the side, geographically locates where exactly Thailand, Madagascar or China are. 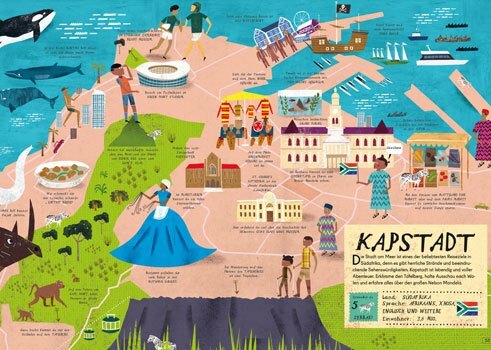 “By way of the maps I wanted to give the children a rough idea of the geographical world in a very simplified form of depiction,” the illustrator explains. 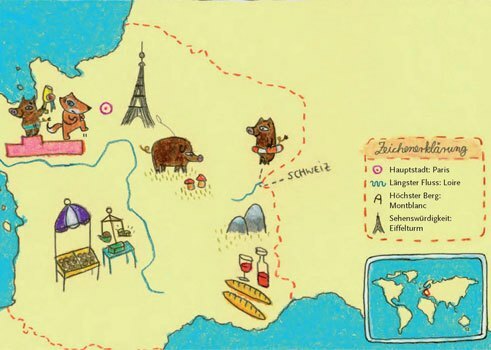 Her maps are characterised by wit and humour; her little vignettes include amusing scenes and animals typical of the country. In his book Einmal um die Welt – Mein Städte-Atlas (Around the World – My Atlas of Cities), the Berlin illustrator Martin Haake depicts a total of 30 cities each on a double page each, with lots of extra tips. “For Einmal um die Welt – Mein Städte-Atlas I looked around a bit first, like a traveller who intends to go on a city tour and informs himself beforehand about his destination. By drawing the maps I then visited those cities, in a sense.” The result is an unusually detailed book in which there is always a lot to discover. Young readers can travel even further with the illustrated book Der Sternenhase (The Star Hare) by Martin Klein, illustrated by Jochen Stuhrmann. The two authors cleverly link a star chart with an imaginative story. Nebo the hare dreams of becoming the guardian of the animals in the star chart. 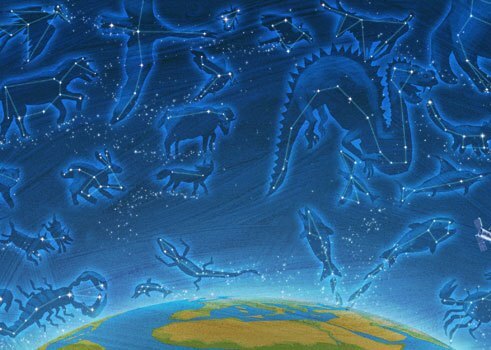 The connections between the stars are illustrated on numerous double pages and at the same time a three-dimensional notion of the animals in the night sky can be seen. Stuhrmann choses exciting viewer standpoints and unusual light settings and his stylistically sound depiction of people and animals are cogent. The high point of the story is a starry sky immersed in a deep blue, where about 30 constellations can be made out. In doing so one can almost forget that a map is only a two-dimensional depiction of reality. 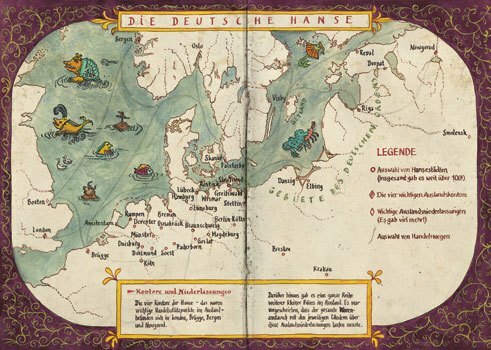 “Around the world with 70 maps – Cartographic finds in children’s literature from three centuries” is the name of a travelling exhibition organised by the International Youth Library in Munich. It contains 70 historical editions from the library’s international stocks some of which are quite valuable. In addition to a German and an English edition, there is also a Spanish edition of the exhibition. The selected maps are mounted on canvas and are presented together with an excerpt from the respective book. These are mostly mixed forms of traditional map and book illustration. The exhibition will be on show at the Goethe Institute in Mexico City during the book fair from 13 November to 16 December 2016. Antje Ehmann works as a free-lance journalist and jury member in the field of children’s and young adults’ literature. Copyright: Goethe-Institut, Antje Ehmann. This work is licensed under a Creative Commons Germany Attribution – NoDerivs 3.0 Germany license.